Brazil is the largest country in South America. It is the fifth largest country in the world by area (8,515,770 km²) and the sixth largest by population (205,737,996). Brazil encompasses several nature zones: tropical rainforests, pampas, savannas and semi-deserts. The Amazon deserves its own mention: one-fifth of all the fresh water on the planet can be found there. To describe it in a few words, Brazil is: beaches, carnivals, stunningly beautiful landscapes, coffee and, of course, football. Almost 75% of Brazilians of both genders are football fans. Boys and girls play the game from a young age, and they play everywhere: on the beach, in the street, and at specially built sites. Brazil is a major talent production line, supplying the world’s premier football clubs with top-class players. Every kid in Brazil dreams of growing up to be a footballer. For Brazilians, life is for celebrating, and the flamboyant carnival in Rio de Janeiro is the distillation of this philosophy. For four whole days, Brazilians dance and party from dawn till dusk. What’s more, no one bats an eye at the provocative outfits or the skin on display. In Brazil, paying attention the female body is not a shameful thing, and complimenting a woman’s behind is perfectly normal. The carnival celebration does have religious roots, however: it is how Brazilians mark the beginning of Lent. Today, the festival has shifted from being a religious celebration to a tourist extravaganza. Mining and agriculture are the backbone of the Brazilian economy. A huge amount of minerals are mined in Brazil (iron ore, phosphorites, gold, and more). Brazil is the world’s biggest exporter of apples, coffee and sugar cane. Its other main exports include transport equipment, vehicles and shoes. It’s wholly possible that one of your pairs of shoes comes from Brazil.Brazil is a former colony of Portugal, which is why the country speaks Portuguese. While there is no language called “Brazilian”, the people of Brazil do not speak standard European Portuguese. They speak a special dialect of Portuguese, although many linguists agree that the differences between the dialect and the original language are insignificant. The country has huge income disparity between different segments of the population. Brazil’s favelas are considered some of the most dangerous places on Earth and experts acknowledge that Brazil is the most violent country among the world’s developing nations: 23% of tourists who visit Rio de Janeiro fall victim to Brazilian criminals. Unfortunately, for many people in the country, there is no other way to survive. Official data shows that unemployment in Brazil is at 13%, rising to 30% among young people in 2017. The situation is likely even more dire in reality. 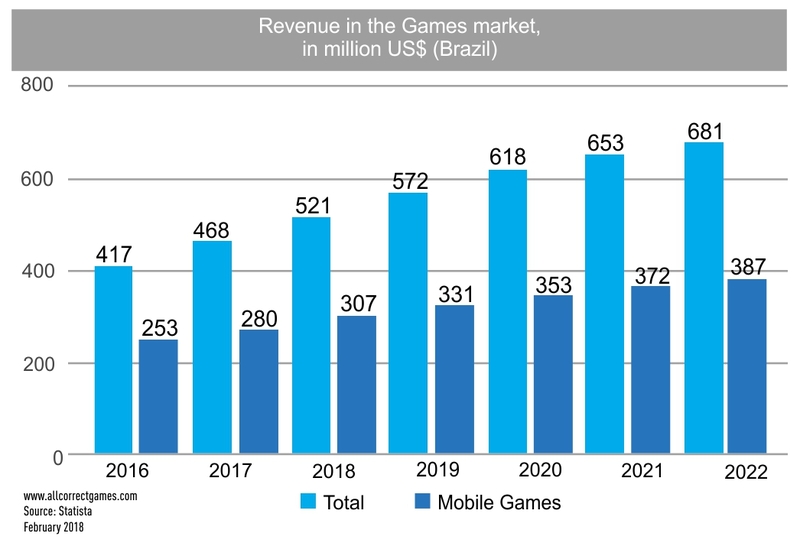 According to Statista, in 2018 the Brazilian games market was worth 521 million USD, 59% of which was attributed to mobile games. In monetary terms, the market share is 307 million USD. By 2022, the market is expected to grow to 681 million USD, with mobile games generating 387 million USD in profit. It is interesting to compare these figures with the report from NewZoo. The analytics agency states that in 2018, the volume of the Brazilian games market was 1.5 billion USD. The difference in figures is likely linked to the methodologies used to calculate the active audience. According to Statista, in Brazil in 2018 there were 50.8 million gamers, but NewZoo claims that there were 50% more gamers – 75.7 million. Who to believe is a matter of personal preference, but we’re going to use the numbers from Statista for the simple reason that pessimism is safer than optimism when it comes to profit projections. 45% of the population use mobile internet in 2018, according to Statista. This should rise significantly and reach 53% by 2022. Mobile internet is more expensive in Brazil than in Russia and is sold in prepaid data bundles. For example, the mobile operator TIM offers a 5 GB bundle for 69 reals, roughly 1,200 rubles. Some operators have better deals, while some offer an improved internet connection and broader 4G coverage for a high price. 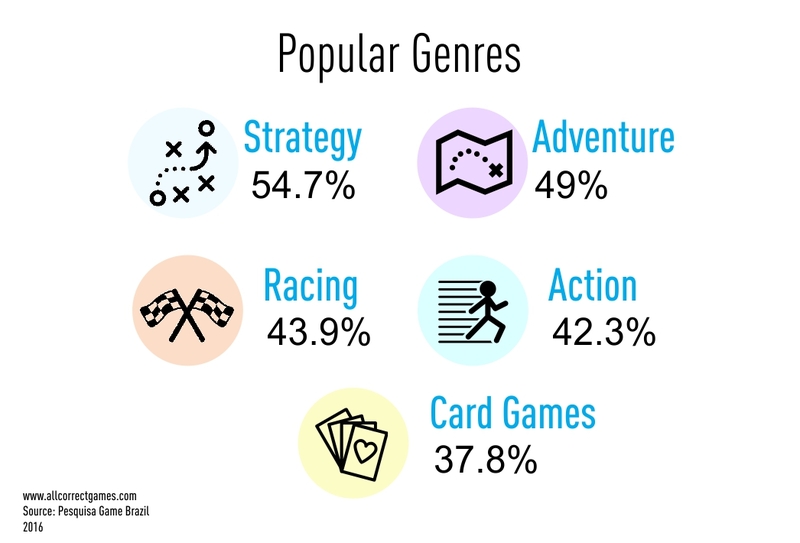 The mobile games segment is the largest. It recently overtook the PC and console games markets and is continuing to grow. The growth rate of the Brazilian games market is showing signs of slowing. In 2018, growth compared to the previous year was 9.8%, and by 2022 this figure will drop to 4.3%. 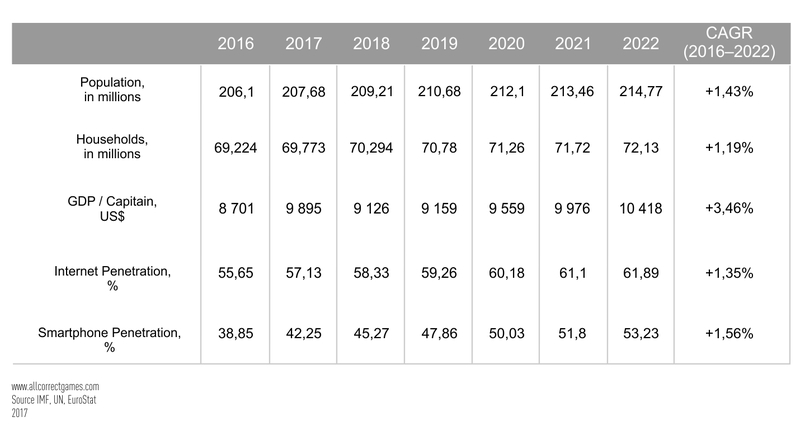 The main driver of growth right up to 2021 will be downloadable games. However, the market is far from maturation. According to Statista, in 2018 games penetration is only at 24.1%. By 2022, this figure is expected to increase slightly to 27%. For comparison, in Japan approximately 65% of the population play games, both on mobile devices and on stationary platforms. The low growth rate of the Brazilian market can largely be explained by the country’s uneven income distribution. 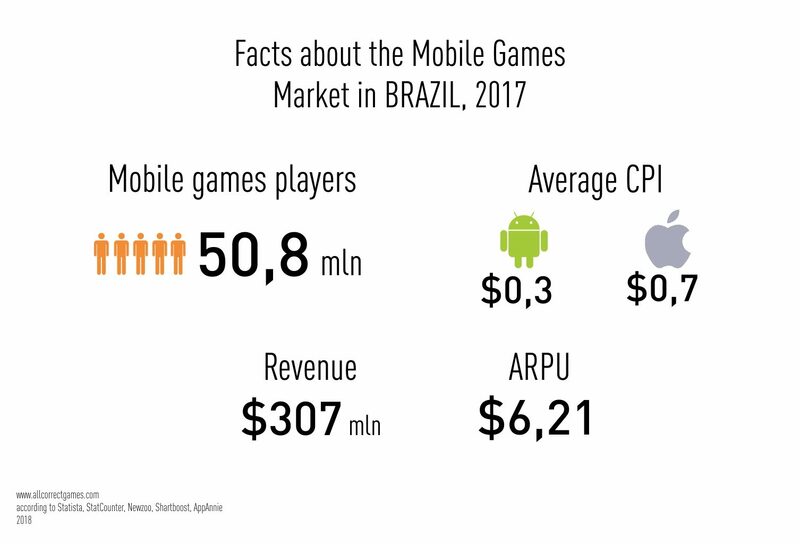 Brazil’s ARPU in 2018 for mobile games stands at just 6.43 USD, this is nine times smaller than in America, one of the ARPU leaders. And this indicator is only expected to grow to 6.93 USD by 2022. In other words, Brazilians prioritize other expenses over in-game purchases. In many ways, this makes the Brazilian market less than promising for mobile developers. However, there is another side to the story. According to Chartboost, acquiring a user on Android costs developers only 0.30 USD, and for an iOS player, developers will only have to shell out 0.70 USD. This is much cheaper than in all developed countries. But from an economic perspective, the cost effectiveness of purchasing Brazilian traffic is debatable.  It is more profitable to work with American, Canadian, or European audiences. We recommend that developers only consider the Brazilian market if the channels listed above have been exhausted. Who plays mobile games in Brazil? In Brazil, men are more likely to play games than women (56.8% of men vs. 43.2% of women). However, women are more likely to play mobile games, and men are more likely to play on stationary platforms. It is interesting that the number of female gamers is growing year on year. Representatives of different genders prefer different genres. *According to data from Pesquisa Game Brasil 2016. According to NewZoo, 12% of all gamers are interested in esports competitions. Unsurprisingly, the most popular esport in Brazil is FIFA. 59% of players periodically watch streams. The age group most represented among gamers – people aged 25 to 34 – constitutes 32.3% of gamers in Brazil. Gamers aged 35 to 44 make up 29.7%. Younger gamers (18 to 24 years old) represent 25.1% of the total. As expected, the older generation show less interest in interactive entertainment: gamers aged 45 to 54 comprise 10.9% of the total, while gamers over 55 make up only 2.1%. According to a Statista survey, 25.3% of gamers say they have a low income. 35.1% of users see their income as average. 39.6% of gamers say they have a high income. At the end of October 2018, the top spot in the Brazilian charts was held by Garena Free Fire – a battle royale style mobile game from Garena. Three games from the same genre were represented in the charts. The popularity of the battle royale genre isn’t dying out, and Brazilian players’ download numbers are proof of this. When looking at the 10 most popular games in Brazil, it’s difficult to identify any real departures from western trends. This is especially noticeable when compared with game charts in Asian countries, where the most popular games vary wildly from the west.Brazilian players are also extremely loyal to two leading projects by Supercell: Clash Royale and Clash of Clans. Brazilian gamers prefer Android devices to Apple products: 85.16% of all users use devices with a Google operating system; owners of iOS smartphones make up only 11.47%. The third most popular mobile OS is Windows, which has a 1.39% market share. In terms of devices, Samsung phones come out on top. 42.16% of users have a Samsung phone. 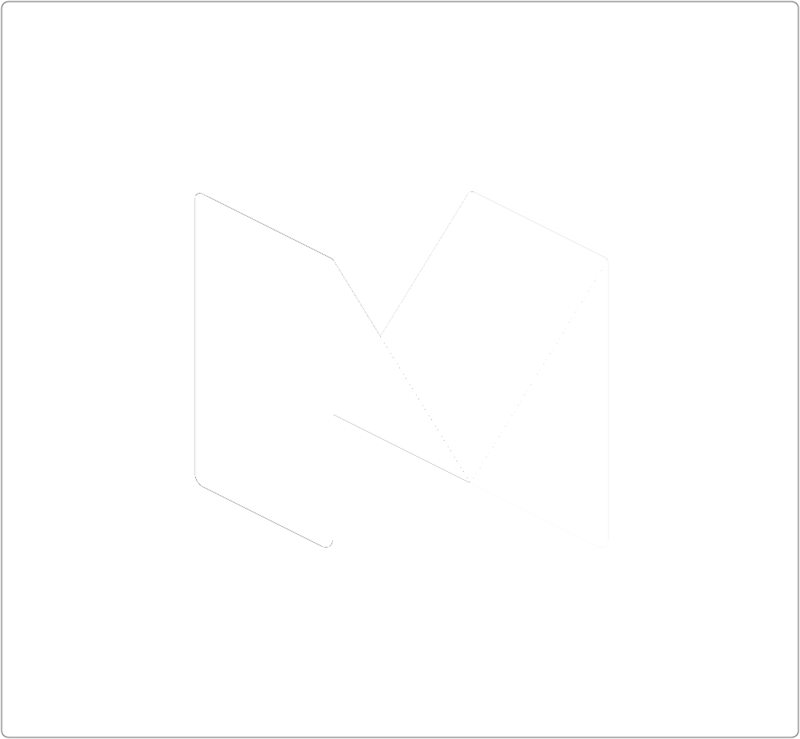 Next is Motorola, which is used by 21.75% of the country’s inhabitants. Third and fourth place go to Apple and LG, which have 11.47% and 11.34% share, respectively. Brazil effectively has only one search engine – Google. It is used by 99.32% of Brazilians. Given this fact, there is little point is discussing other search engines. The main social network in Brazil is Facebook. It is used by 52% of the population. It is followed by YouTube (25.86%) and Pinterest (11.01%). It is interesting to note that Instagram is not very popular in Brazil: only 2.44% of Brazilians actively share their photos on this social network. It is quite difficult to identify any specific cultural attributes that all Brazilians possess. This is due to the huge size of the country and the large number of ethnic groups that live in Brazil. However, one thing unites all Brazilians is an incredible passion for life, carnivals, festivals, music and, of course, football. 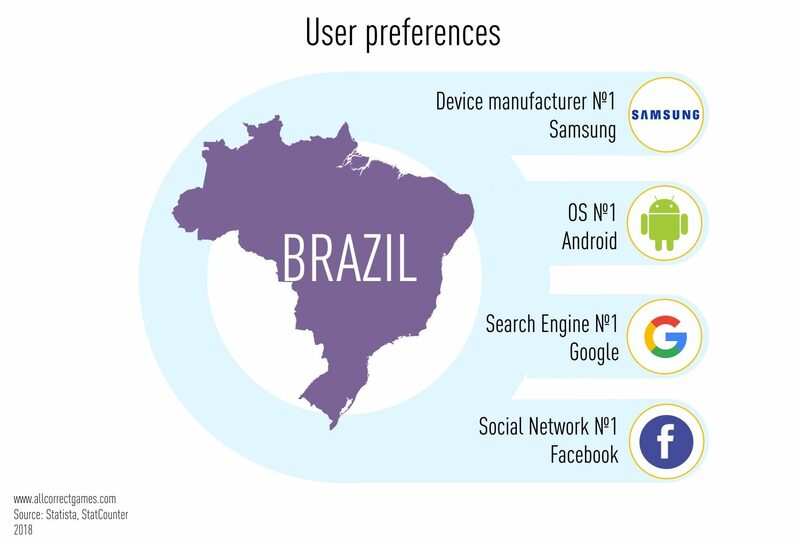 Brazilians are very socially active, they love to talk, so the presence of social features in your app will benefit it. Racism is not a problem in Brazil. Throughout its history, the country has encountered and absorbed many other cultures, and Brazilians are open and friendly to people different from themselves. Many Brazilians are shocked by the idea of racial discrimination. For this reason, developers are unlikely to hear complaints from Brazilians about the representation or lack of representation of specific races in their game. Brazilians take the same view on sexual minorities: they don’t care who you love or how you express it. Brazilians have the concept of “jeitinho brasileiro” or the Brazilian way of doing things. This phrase covers absolutely all spheres of life and encapsulates the “couldn’t care less” attitude of Brazilians and their ability to solve difficult problems with the least possible effort. As a result, the vast majority of Brazilians are very lazy and corruption is rife in the country. The cult of beauty is prominent in Brazil. It has the highest number of cosmetic surgery procedures performed anywhere in the world. Women are more likely to opt for cosmetic surgery, but there are also examples of men who want to make their body or face more beautiful. It makes sense that this would extend to mobile games as well – beautiful characters in promotional materials will add a few percentage points to your install conversions. Another thing: Brazilians are happy people. Most of them are poor, but this doesn’t stop them from enjoying life in all its forms. They laugh in the face of problems, always notice the good even in the worst situations, and try to focus only the positives. Like in Russia, in Brazil there are major issues with piracy. The low earnings of most Brazilians mean that they simply don’t have the money to pay for entertainment. This means that even popular games might not generate a profit for the developer. In this case, the most profitable monetization strategy is F2P with in-game advertising. GameDevMap reports that Brazil has 57 companies working in games development. We should point out that there are no local major developers, only subsidiaries of major companies from overseas. Disney Interactive Studios, Gameloft, Riot Games and Ubisoft have opened offices in Brazil. Interestingly, one of the most successful games companies in Brazil is Tectoy, which rose to prominence for making consoles and publishing games for Sega. Its development is very similar to that of Dendy, except that Tectoy immediately signed an official contract with the company. Tectoy was involved in the development of the Zeebo, a budget console for developing nations, which was released in 2009. The project was not a success: the company only sold 30,000 consoles out of a projected 600,000. Brazil has no official language, although Brazilian Portuguese is the de facto equivalent, as it is spoken by the overwhelming majority of the population. Brazilian Portuguese differs from European Portuguese primarily in its phonetics. African and indigenous Brazilian cultures have had a significant influence on the culture and language of Brazilians, which explains the large number of loanwords. European Portuguese also contains influences from French and English, languages that have had little contact with Latin America. Differences in reading rules. In Brazilian Portuguese, ou is pronounced like ô, words ending in r or l often drop these letters entirely when pronounced, lh is pronounced l’ in Portugal and j in Brazil; the ending s in many nouns and verbs is often omitted: Brazilians say as casa instead of as casas, nós havemo instead nós havemos and even nós come a fruta instead of nós comemos a fruta. Pronunciation among speakers in South America is smoother than among inhabitants of the Old World. Sounds are typically stretched out and stressed (e.g. éverdaaade, nooossa, seja bem-viiindo). The pronunciation of individual sounds also differs. A Brazilian r is usually pronounced as something between an h and an r, and que is pronounced softly: ki(e), where the i sound is somewhere between an ee and an e (in Portugal, que is pronounced as a hard keh). Brazilian Portuguese is considered easier to understand than its European counterpart, since in Portugal pronunciation is characteristically fluid, sounding somewhat “garbled” and indistinct, with some vowels being swallowed. 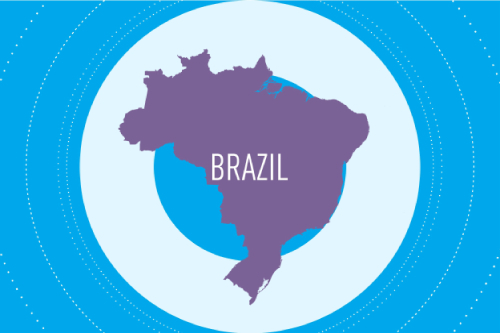 The northern and southern dialects of Brazilian Portuguese are also noticeably different. The northern dialect is closer to European Portuguese, although in major cities (Brasilia, São Paulo, Rio de Janeiro) you are more likely to hear the southern dialect. There are at least 16 variants of Portuguese spoken in Brazil today. This is linked both to the geographic spread of the country and to historical factors: immediately after the nation gained independence from Portugal, people from all over the world began immigrating to Brazil. People from Rio de Janeiro speak the version of Brazilian Portuguese closest to European Portuguese. Localization is a major plus for Brazilian players. According to research by Pesquisa Game Brasil 2016, gamers put only price, popularity of the franchise, and press reviews ahead of localization as factors that affect their decision to buy a game.